In July 1997, in honor of the 50th anniversary of the alleged UFO crash at Roswell, New Mexico, CNN/Time magazine took a poll that indicated that 80 percent of Americans thought the government was hiding knowledge about the UFO mystery. Other interesting data included the assertion that 64 percent believed that alien life-forms have made contact with humans. Of that 64 percent, 37 percent said the ETs have abducted humans, and 37 percent are certain that the aliens have contacted representatives of the U.S. government. On June 10, 1998, a follow-up CNN/Time poll revealed that 27 percent of all Americans believed that space aliens have visited Earth and 80 percent believed that the U.S. government is conducting a cover-up of the alien presence. The most prevalent conspiracy theory contends that the government learned the truth about UFOs at the site of the Roswell, New Mexico, crash in 1947 when the military recovered alien corpses. A secret group known as Majestic-12 keeps the U.S. president and other world leaders briefed on the progress of alien activity on Earth. While the governments of Earth officially deny the existence of UFOs to prevent panic among the masses, the chief executives are well aware of the existence of extraterrestrial involvement in world affairs. An arm of the U.S. "shadow" government, in association with the Illuminati, an alleged worldwide secret society, made a deal with the alien invaders to trade advanced extraterrestrial technology for such Earth resources as water, minerals, cattle—and certain of its citizenry. UFO abductions are conducted by aliens as a species-monitoring program. Physical examinations of humans and crossbreeding attempts involving preselected men and women are allowed by the government as a treaty concession. As the year 2000 grew nearer, many fundamentalist religious sects became obsessed with fears concerning the millennium and Armageddon, the great final battle between Good and Evil. Such an obsession created a mind-set of suspicion that had many members of these religious groups identifying Satan's minions gathering to fight the forces of Good as aliens arriving on UFOs. A number of fundamentalist Christian evangelists began to blend accounts of UFOs with the old fears of secret societies composed of top U.S. government officials, politicians, corporate chairmen, and international bankers who were seeking to bring into being a dreaded "New World Order." Rumors spread that extraterrestrials and powerful members of secret societies had agreed that shortly before the year 2000 a carefully staged false alien invasion would convince the masses of the world that an attack from outer space was about to begin. People of all nations would believe the leaders who advised that unconditional surrender to the aliens was for everyone's own good. Immediately following their betrayal of Earth to the aliens, the united leaders would form a One World Government, a New World Order, thus fulfilling biblical prophecies about a return to the days of Babylon. The aliens would reveal themselves as demonic entities, and the planet would be in torment until Jesus returned to deal the final blow to the armies of evil. of men and women who claimed to have witnessed UFO phenomena protested that they had subsequently been harassed and spied upon by mysterious unmarked black helicopters. And the once-benign space brothers were largely replaced by nasty alien abductors who wanted to perform painful physical examinations aboard motherships and steal human ova and sperm for their genetic experiments in creating a new hybrid species. 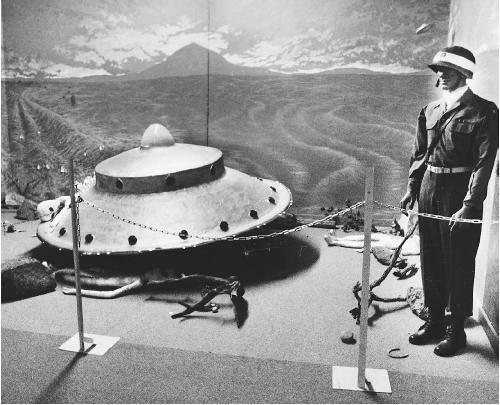 On June 24, 1997—the 50th anniversary of Kenneth Arnold's sighting of the flying saucers in Washington State—the United States Air Force conducted a special Pentagon briefing and announced its answer to the charges of a conspiracy at Roswell in the document The Roswell Report: Case Closed. This publication, stated Colonel John Haynes, would be the Air Force's final word concerning 50 years of accusations that the government was hiding evidence of extraterrestrial visitation. The debris found at the crash site outside of Roswell were fragments from a balloon from Project Mogul, a top-secret intelligence gathering operation, that had commenced immediately after the end of World War II (1945). Its mission had been to spy on the Soviets and to monitor their nuclear program; therefore, the cover-up had been necessary for purposes of national security. The air force report went on to state that the alleged bodies seen around the crash site were not those of extraterrestrial beings, but were dummies, roughly the size of humans, that had been used in experiments with high-altitude parachutes. After each of the experimental drops, which had begun in 1953, air force personnel would retrieve the simulated human forms. Apparently, folks around Roswell had observed some of these recovery missions and thought that they had witnessed military personnel picking up alien bodies. UFO researchers scorned such an explanation of the alleged crash debris having been a balloon and the true nature of the alien corpses having been parachute dummies. And then there was the question of how those witnesses who claimed to have seen wreckage of a flying saucer and the bodies of its extraterrestrial crew in 1947 could have confused the event with the discovery of dummies dropped over the desert near Roswell in 1953. Colonel Haynes explained the six-year discrepancy between the events as a manifestation of the mental phenomenon of "time compression" on the part of the witnesses. Time compression, he stated, occurs when one's memory melds events separated by many years into "compressed" segments of time. Civilians who witnessed the crash site of a weather balloon in 1947 and, six years later, saw air force personnel retrieving crash dummies dropped from the skies, recalled the two events as one in their compressed memories. The official explanation issued by the air force in its publication The Roswell Report: Case Closed accomplished little in quelling the accusations of a government conspiracy regarding the mystery of what really occurred in July 1947. Roswell has become a Mecca for UFO believers from all over the world, and the city hosts an annual celebration to honor the alleged crash of the flying saucer in the desert. In March 2002, a survey conducted in the United States by the National Science Foundation yielded the results that 30 percent of those individuals polled believed that space vehicles from alien civilizations regularly visit the skies of Earth. An extensive survey of paranormal beliefs in the United Kingdom taken in June 2002 found that 47 percent of its citizens believed in visitations from extraterrestrials. As UFO investigations enter the twenty-first century, the mystery grows unabated. On July 26, 1952, UFOs made national headlines when they were sighted over Washington, D.C. The mysterious objects were detected on civilian and military radar screens and fighter planes were dispatched to investigate. Exactly 50 years later to the day, July 26, 2002, the North American Aerospace Defense Command (NORAD) scrambled two D.C. Air National Guard F-16 jets out of Andrews Air Force Base to investigate unknown aerial craft over the nation's capital. Accusations of government cover-ups and conspiracies continue, and the old stories of secret agencies and aliens conspiring to deceive humankind circulate freely. The media report strange occurrences such as crop circles and cattle mutilations. Late-night radio talk shows feature bizarre accounts of the air force's Area 51 and of scientists working in underground laboratories to back-engineer the wreckage of alien space vehicles. And some individuals argue that the alien interference in the events of planet Earth may go back even to the days of World War II (1939–45) and such controversial endeavors as the Philadelphia Experiment. Fawcett, Lawrence, and Barry J. Greenwood. Clear Intent: The Government Coverup of the UFO Expe rience.Englewood Cliffs, N.J.: Prentice-Hall, 1984. Friedman, Stanton T. Top Secret/Majic. New York: Marlowe, 1996. Klass, Philip J. UFOs Explained. New York: Random House, 1974. Randle, Kevin D. The Randle Report: UFOs in the '90s. New York: M. Evans, 1997. Randle, Kevin D., and Donald R. Schmitt. The Truth About the UFO Crash at Roswell. New York: M. Evans, 1994. Sachs, Margaret. The UFO Encyclopedia. New York: Perigee Books, 1980. Story, Ronald D., ed. The Encyclopedia of Extraterres trial Encounters. New York: New American Library, 2001. Corso, Philip J., with William J. Birnes. The Day After Roswell. New York: Pocket Books, 1997. Darlington, David. Area 51: The Dreamland Chroni cles. New York: Henry Holt, 1997. ——. Roswell Crash Update: Exposing the Military Coverup of the Century. New Brunswick, N.J.: Global Communications, 1995. Howe, Linda Moulton. Alien Harvest: Further Evi dence Linking Animal Mutilations and Human Abductions to Alien Life Forms. The Author, 1993. ——. Glimpses of Other Realities. Vol. 2, High Strange ness. New Orleans: Paper Chase Press, 1998. Lindsay, Reed. "Eerie X-File of the Pampas." Sun Jour nal, July 23, 2002. [Online] http://www.sunspot.net/templates/misc. Oyan, Katie. "Cattle Mutilations Back." Great Falls Tribune, January 3, 2002. [Online] http://www.greatfallstribune.com/news/stories/20020103/topstories/1410092.html. Andrews, Colin, and Pat Delgado. Circular Evidence. London: Bloomsbury Publishing, 1990. "Experts 'Amazed' by Crop Circle Designs." BBC News, July 19, 2002. [Online] http://news.bbc.co.uk/hi/english/uk/england/newsid_2138000/2138424.stm. Howe, Linda Moulton. Mysterious Lights and Crop Cir cles. Penn. : Linda Moulton Howe Productions, 2002. Lin, Rosanne. "China Says Crop Circles Appeared There 3,000 Years Ago." The Shanghai Star, August 2, 2002. [Online] http://www.rense.com/general27/crops.htm. Manistre, Hugh. Crop Circles, a Beginner's Guide. London: Hodder & Stoughton, 1999. Pringle, Lucy. Crop Circles—The Greatest Mystery of Modern Times. New York: HarperCollins, 2000. Silva, Freddy. Secrets in the Fields: The Science and Mysticism of Crop Circles. Charlottesville, Va.: Hampton Roads, 2002. Beckley, Timothy Green. MJ-12 and the Riddle of Hangar 18. New Brunswick, N.J.: Inner Light Publications, 1989. Friedman, Stanton T., and Don Berliner. Crash at Corona: The U.S. Military Retrieval and Cover-Up of a UFO. New York: Marlowe, 1994. Randle, Kevin D. Case MJ-12: The True Story Behind the Government's UFO Conspiracies. New York: Avon, 2002. Strieber, Whitley. Majestic. New York: Berkley Pub lishing, 1990. Berlitz, Charles, and William Moore. The Philadelphia Experiment: Project Invisibility. New York: Fawcett, 1981. Commander X. Philadelphia Experiment Chronicles. New Brunswick, N.J.: Inner Light Publications, 1994. Deary, Terry. The Philadelphia Experiment. London: Kingfisher, 1996. Goerman, Robert A. "Alias Carlos Allende: The Mys tery Man Behind the Philadelphia Experiment." Fate magazine, October 1980. [Online] http://www.parascope.com/en/articles/allende.htm. Wells, Jr., K. B. The Montauk Files: Unearthing the Phoenix Conspiracy. Tempe, Ariz.: New Falcon, 1998. In the year 1997 there was a man who had printed out the entire webpages of the wingmakers websites and had told me that he has researched the wingmaker ancient arrow projects for many years and said that it was of interest to him because he was watching the skyies waiting for alien to come down to the earthly planes and he waited another year before realizing that the alien had landed but he couldn't find that alien and had found a aboriginal community that had summoned a dark alien that was evil to humans that mutilated the animals whenever a animal came near that alien but the scientists ABANDONED that alien and feared the alien that mutilated the animals and that tore to pieces the cattle that were found in the state of New Mexico so the german man and the czechoslavakia psychologists had tried to locate the light being aliens but were not landing near where they had intended the aliens to appear but I had not mentioned this to the people who had waited for the alien to land in the area of Oyama Mountain where Senator Arnold Swarznegger had visited in 1988 when I was visiting my sister near where they had been waiting for aliens to land on the top of Oyama Mountain in Canada but the alien light being isn't from ATLANTIS and the other alien IS FROM ATLANTIS.........so what would you suggest I do when the researchers are knocking at my door asking me where the alien landed? I think that now that we have two space telescopes that can prove we are but one tiny planet in a Primordial Sea of Billions of Planets and many solar systems and Black holes etc etc that we now must realize that we cannot be the only Genetic Source of Beings alive. The Earth has so very many different types of beings or animal species, Plant species, and insect species that we must rationally realize that there can very easily be other life on these other planets or solar systems. Some of these life forms may be more intelligent than us and they could easily be either hostile or peaceful. We must be carefull sending signals all through solar systems and should be listening and not transmitting because if they are hostile they could easily anilate us or use us as a food source or alot of death causing things could happen. I know we are probing into deep space and I think we should focus the Earth's Nations and resources into pulling together to work together to build the blocks that will put the human race into deep deep space and beyond. We are at the beggining stages of exploration like man was over a thousand years ago when it built ships to sail the unknown seas on Earth. Now the challenge is greater far greater. We need to focus on the technology that will get us into deep space and can carry man and the human race and the genetic seeds of all forms of life from this planet and use it to seed all the other planets and solar systems with our genetic material in order for some of it to grow and take root across the Universe. I do believe it is entirely possible for the UFO's to have visited here. Someday we will be the UFO's on somebody else's planet. I hope we evolve Technologically quickly so that not only is this possible but so that we are up to any challenges should they present themselves from a Alien Life Form come to this planet after following our continuous Transmissions into space. We cannot be the only beings on one planet out of millions to billions of other planets. What are the odds of that??? If we are the only beings then we need to start deep space exploration in full steam ahead fashion and get to genetically seeding the universe with the Human Race and the Animals and plants needed to feed those Human Beings with. Keep up the hope of finding a positive and helpfull more advanced race of Beings.